Knowing How to Install Wooden Fence is a little easier with the help of a local fence company in Oklahoma City! Here we'll cover Installing Fence Posts in Part 4 of Building a Wood Fence. Sixth, you need to plant or place your posts. Stretch out your tape and place the posts on center or wherever they were supposed to be centered. If you need to drive the steel post in you can use a post driver; if you don’t want to spend the money just dig a little deeper. If you drive the posts in some they will stay, if not you will need to two people, one to hold the post and one to pour in concrete. When leveling the pole and placing it, you want to be going off the bottom string line so the bottoms of the poles are straight and in line. Your building a great looking wood privacy fence, so drive or dig those posts to the same depth for each one if you are on level ground. If you are on sloping ground then you want to make allowances with the rise and fall of the ground. It just doesn't look pretty when the tops of your posts are all different heights, one above the top of the fence line and one for example right at the stringer. 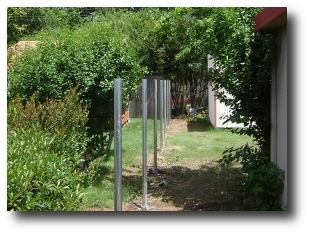 See how another fence company's install of their posts (to the right) is quite inaccurate? We wouldn't want them building a wood fence for us. They don't know how to build privacy fence very well! So, level even the tops with each other. You can do this simply by using something as quick as the bridge of your nose, or eye level height, or you can even measure each one.